What an accessible exam room should look like! 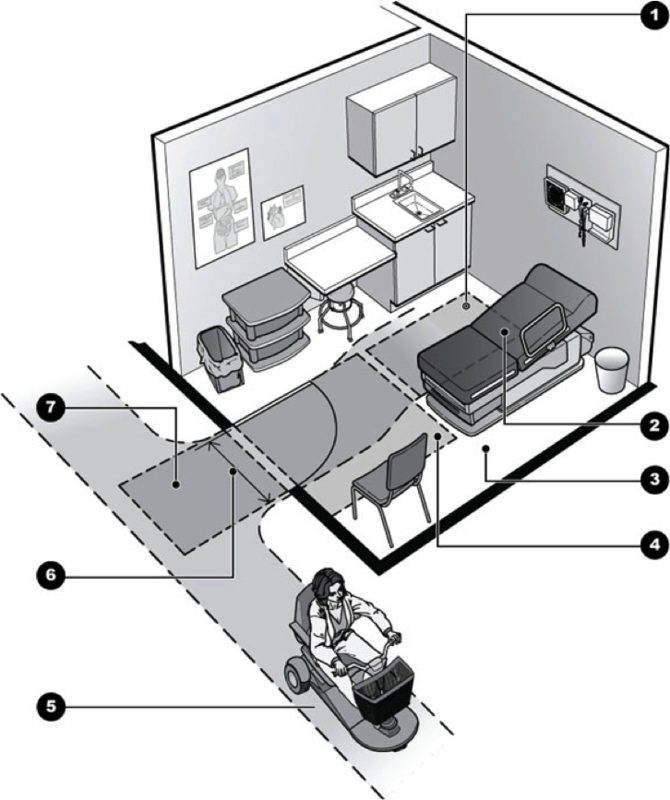 A clear floor space, 30″ X 48″ minimum, adjacent to the exam table and adjoining accessible route make it possible to do a side transfer. Adjustable height accessible exam table lowers for transfers. Providing space between table and wall allows staff to assist with patient transfers and positioning. When additional space is provided, transfers may be made from both sides. Amount of floor space needed beside and at end of exam table will vary depending on method of patient transfer and lift equipment size. Accessible route connects to other accessible public and common use spaces. Accessible entry door has 32″ minimum clear opening width with door open 90 degrees. Maneuvering clearances are needed at the door to the room. Note: Additional clear floor space can be provided by moving or relocating chairs, trash cans, carts, and other items.